With a straight forward, user-friendly and highly intuitive design the single KYWI mag pouch is like no other on the market. Utilizing a hybrid Kydex and nylon design, you get all the rigidity you would expect from a kydex pouch and the lack of noise you want from a nylon pouch. These pouches include our kydex wedge insert (KYWI) that provide the needed retention to secure your magazines without the need for bungee cords or flaps. 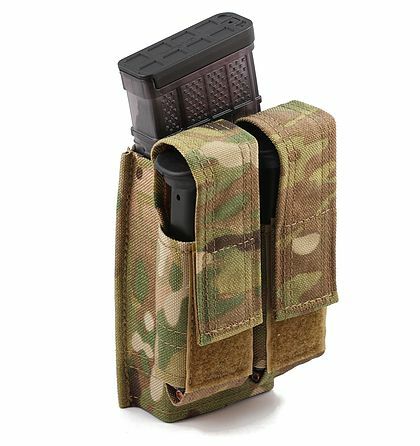 This pouch is also more flexible than a standard kydex carrier, ideal for field use. 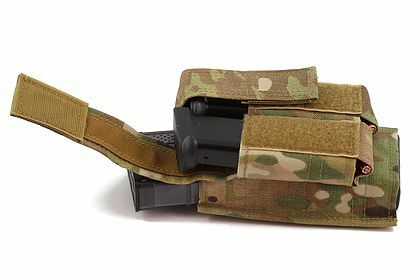 Features 1 x M4 KYWI Mag Pouch with Kydex insert and 2 x Pistol Mag Pouches with Velcro Flaps that do NOT have Kydex inserts. Pistol pouches are soft to allow multiple types of items to fit, including multi-tools and flashlights. Attaches to MOLLE/PALS using MALICE Clips (Included). Can be adapted to attach to belts via Esstac KYWI Belt Loops (sold separately). Note: Aluminum and steel rifle magazines may need sharp edges chamfered or polished to alleviate excessive wear to the Kydex insert, particularly around the mag release notch.